WOONSOCKET, R.I., May 19, 2016 /3BL Media/ – CVS Health (NYSE: CVS) today released its annual Corporate Social Responsibility (CSR) Report, entitled Prescription for a Better World, which describes the company’s CSR strategy, and provides performance updates on its CSR goals and initiatives in 2015. The ninth annual Report also introduces a number of new targets in priority areas. Leader in Growth – focused on conducting business with integrity. The Report is available online at http://cvshealth.com/social-responsibility/corporate-social-responsibility. Among the new targets announced in this year’s Report, four are aimed at creating a tobacco- free generation by 2020. These include reaching five million youth with tobacco-free messaging; doubling the number of tobacco-free institutions of higher learning; and achieving a 10% decline in new youth smokers, as well as a 3% decline in the national youth smoking rate. Progress toward these targets will be fueled by CVS Health’s Be The First campaign, a five- year, $50 million initiative to help deliver the nation’s first tobacco-free generation. In reporting on its environmental commitments, the company announced it has exceeded its greenhouse gas (GHG) intensity target three years ahead of schedule. In 2010, CVS Health set out to reduce GHG intensity by 15% per square foot of retail space by 2018. By the end of 2015, the company measured a 16% reduction in GHG intensity. CVS Health intends to continue working toward further reductions and establish a new GHG emissions reduction target within the next two years. Other multi-year environmental commitments are disclosed in this year’s Report, including water reduction targets, and another focused on procuring 100% of the company’s paper supply from sustainable sources by 2020. In 2015, CVS Health continued to deliver on its commitments to operate with integrity and implement best-in- class workplace practices. Efforts in 2015 included hiring more than 95,000 new colleagues, strengthening diversity networks, enhancing supplier audit protocols, and increasing company spend on diverse suppliers. Newly-announced multi-year targets within the Leader in Growth pillar include increasing participation in the company’s Colleague Resource Groups to 10% of the corporate workforce by 2025; and a 10% year-over- year increase in the hours volunteered by colleagues. “As I look ahead to the next 10 years, I see so many opportunities for our CSR strategy to play a bigger and more significant role in supporting our business, while delivering more value to our communities and stakeholders,” added Eileen Howard Boone, SVP of Corporate Social Responsibility and Philanthropy for CVS Health. 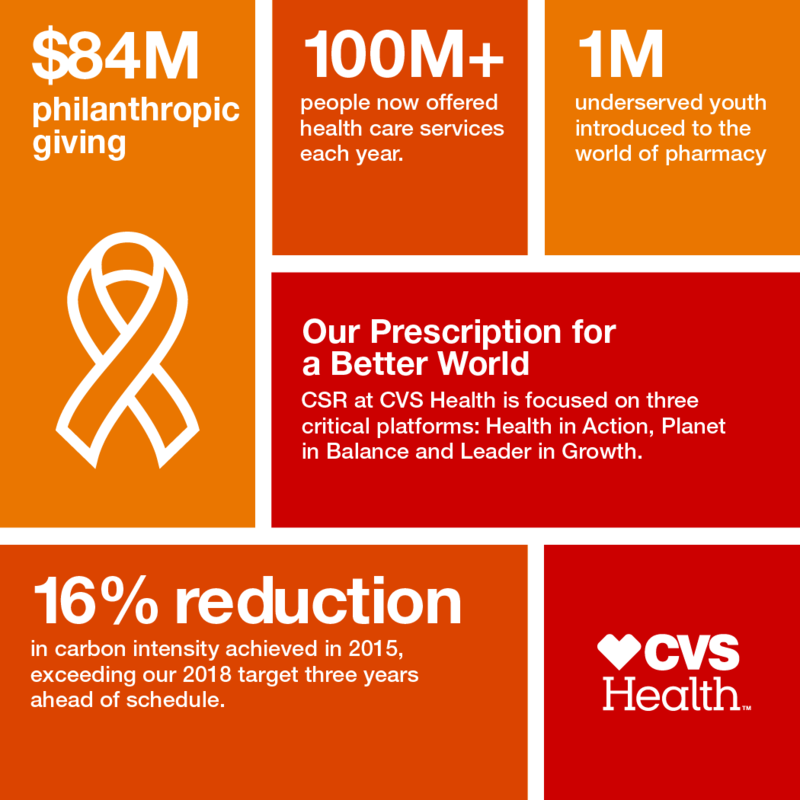 CVS Health’s 2015 Corporate Social Responsibility Report was developed in accordance with the Global Reporting Initiative (GRI) G4 Guidelines, an international framework that is widely used by organizations to report on their CSR and sustainability performance. The GRI Materiality Disclosures Service verified that, at the time of publication of the report, General Standard Disclosures G4-17 to G4-27 were correctly located in both the GRI Content Index and in the text of the final report. For more information on GRI, visit http://www.globalreporting.org/.